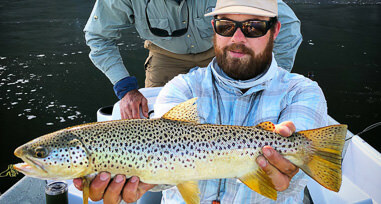 At Montana Angler Fly Fishing we pride ourselves on having the regions hardest working guides. In an area that is as renowned for fishing as ours, great fisherman are easy to find but great guides are a precious commodity. We've been in this business for a long time and have worked with hundreds of guides on rivers throughout the West. We understand that a knowledgeable, patient and enthusiastic guide can make your Montana fishing trip truly unforgettable. Our team is comprised of several of the most respected professionals in the industry - the best of the best. Our guests describe our all-star crew as patient, passionate and fun. We look for guides that are not only superb fisherman, but also great teachers with expert rowing skills. 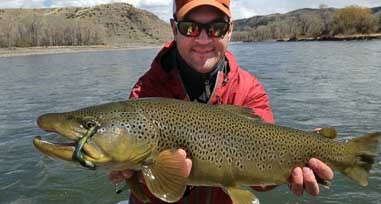 Montana Angler Fly Fishing is one of Montana's only outfitters that offers both traditional drift boat trips and remote canyon floats in fly fishing equipped whitewater rafts. Thanks to our seasoned guides, our ratio of returning clientele is one of the best in the business! Matt is the kind of guy that makes mortal men jealous. There isn't a week that goes by that he isn't fishing, skiing, hiking or rafting. He spends over 140 days a year guiding fishing trips on Montana waters and in the off season he travels and hosts international trips to Patagonia, New Zealand and beyond. Matt is as "fishy" as they come, he always seems to be parked in the honey hole...usually with plenty of bent rods and smiling faces. He attended the University of Alaska and Montana State University where he earned a B.A. in K-8 education. 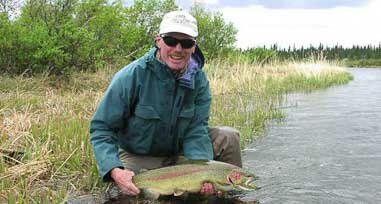 Bill has been guiding fly fishing trips in both Alaska and Montana for over 15 years. He is the consummate professional and never fails to go the extra mile to do whatever it takes to make sure your day exceeds all expectations. He has earned the reputation as being one of the elite superstars of our profession. His fish radar is unparalleled and there is rarely a day on the water when another boat is bending more rods than his. He runs both a top of the line fiberglass skiff and a customized raft which allows him to fish just about every body of water from Billings to Missoula. There is no nook or cranny of Southwestern Montana that he hasn't explored and he loves sharing his favorite off the beaten path gems with our guests. Bill is also a world class skier and in the off season guides heli skiing trips in Alaska. It is hard to find a more genuine or pleasant guide than Billy Buchbauer. Miles has over 16 years of guiding experience that includes leading trips on several of the West's premier rivers including multi-day wilderness trips. He has a reputation of doing whatever it takes to show his guests a great time on the river. Miles also has extensive whitewater training allowing him to use both drift boats and rafts in waters that other fishing guides avoid. In the off season, he works as a high school science teacher instructing Biology and Chemistry. He also moonlights as an adjunct professor and doctoral student within Montana State’s Department of Education. In his distinguished tenure as a teacher, he was recognized for a variety of accomplishments including being named a national finalist for the Presidential Math and Science Teaching Award. His penchant for education quickly becomes evident after spending a day with Miles on the river. Miles holds a B.S. in Biology and a B.S. in Science Education from Penn State as well as a M.S. in Science Education from Montana State. Doug is a true fly fishing fanatic. 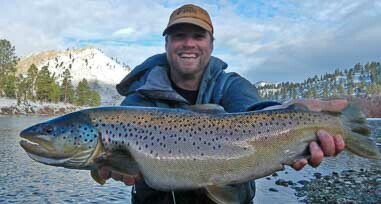 He is comfortable on the larger blue ribbon rivers and also excels at finding off the beaten path wade fisheries. Doug spent several years working and fly fishing in Yellowstone Park when he moved to Montana and is our resident guru on the legendary waters in the Park. He is a Georgia native where he grew up chasing brook trout in the Appalachian mountains. He received a B.S. 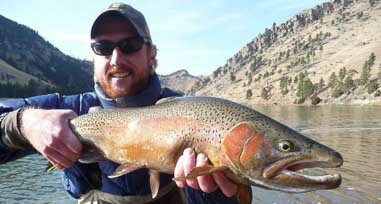 in Social Science education and helps author fly fishing articles for the Montana Angler blog in the offseason. Jared is a native of the Gallatin Valley where he grew up fishing the Madison, Gallatin, Yellowstone and countless smaller waters as his home waters. Jared is a passionate outdoorsman and spends nearly all of his time guiding fishing, fishing on his own, archery hunting or working on a large ranch near Springdale in the offseason. He has a fisheries and wildlife management degree from Montana State University and is eager to share his extensive knowledge of the diverse ecosystems found in our local watersheds with our guests. Jared's confident and easy going personality are traits that are greatly appreciated by his guests. He has a careful eye and knows when to sprinkle in some well timed instruction or back things off a bit if he senses frustration. Few guides will work harder on the water than Jared. 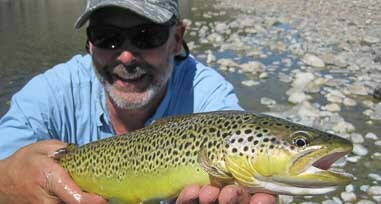 Scott brings over 35 years of guiding experience to the Montana Angler staff. After studying architecture at MSU for five years, he eventually graduated with a degree in fly fishing and went on to start a commercial fly tying company in Costa Rica that employed 23 professional tiers. He eventually became one of the head guides at the Teton Valley Lodge in Idaho where he spent 22 seasons guiding on famous waters such as the South Fork of the Snake and the Henry's Fork. Scott also guided in Alaska and even worked as a risk manager where he visited every fly-out fishing lodge from Anchorage to Kodiak Island. He has spent 22 years ski patrolling Grand Targhee resort in Idaho and is currently on the patrol staff at Bridge Bowl here in Montana. Scott's 35 years of guiding experience, passion for teaching and fabulous stories are always worth the price for admission. 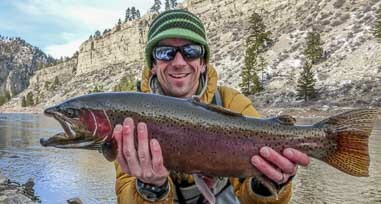 Josh left a career in corporate construction management to pursue his passion for fly fishing and become a guide. By focusing on the teaching aspect of guiding, Josh has something to offer to every level of angler. He puts forth an amazing amount effort each and every day on the water to put his guests into fish and always maintains a calm and supportive attitude along the way. Josh enjoys endurance sports and is the only guide we know who routinely runs 10+ miles after a day on the water. 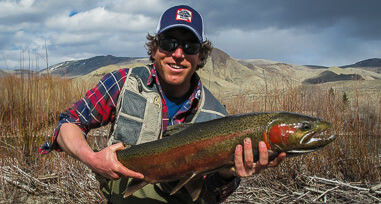 During the off season, you will find Josh pursuing Steelhead with his spey rod. Josh is a graduate of Parkland College in Illinois and a United States Army veteran. Ian grew up 45 miles off the grid on the North Fork of the Flathead River adjacent to Glacier National Park. Learning to fish and hunt from his dad he established a solid foundation and appreciation for the great outdoors. Shortly after high school Ian moved to Bozeman, earning his first degree in business management from Montana State University, and a second, unofficial degree in fishing and floating on the waters of the Madison, Gallatin, and Yellowstone. For seven seasons he also whitewater raft guided on the Middle Fork of the Salmon River in Idaho's Frank Church Wilderness. It is here where he gained a full appreciation for all things related to rivers; fish, scenery, wild rapids, and the satisfaction of sharing these remarkable places with others. When not on the water, Ian enjoys spending time with his wife and raising their young daughter. Adam grew up in Minnesota with his twin brother Eric. He moved to Montana in 1995 where he continued to explore his passion for fishing as well as mountaineering. After studying social studies education at Montana State University he became a professional Mountain Guide in 2001. In the off season Adam continues to guide climbing expeditions on some of the world's highest peaks in locations such as Mexico, Peru, Ecuador, Alaska, Russia and Nepal. He helped with the creation of the Khumbu Climbing School in Nepal, a non-profit dedicated to teaching the Sherpas of Nepal critical skills to safely work with Western climbing expeditions. Adam is extremely patient on the water and always keeping a sense of humor while working hard to get the task at hand accomplished, whether it be climbing a summit or finding hungry fish. 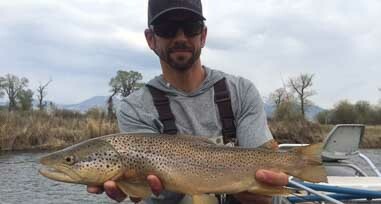 Adam resides in Bozeman and spends his time off the water raising his young and active son. Ben has been guiding trips on some of the best trout fisheries in the world for 15 years. After growing up on a cattle ranch in northern California and attending Chico State University, Ben began guiding professionally and honing his craft on the waters of Montana, Wyoming, New Zealand and Alaska. 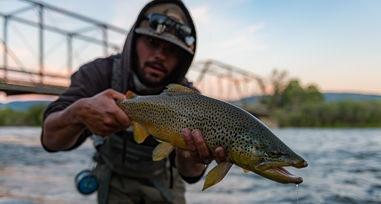 After exhausting the fishing options around Jackson Hole over his ten years of guiding there, Ben made the move to Bozeman to take advantage of the diverse fishing options southwest Montana has to offer. In a throwback to his days of guiding in New Zealand, Ben still loves to sight fish with dries. When not out fishing, you will find Ben duck hunting, chasing deer and elk with his bow, or exploring local mountains on his skis or snowmobile. 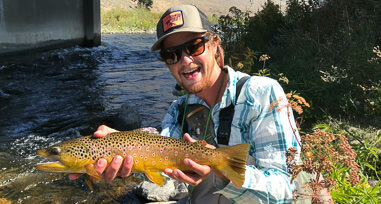 Luke was born in Livingston, Montana to a fly fishing family. Luke’s father was among the earliest fly fishing guides in southwest Montana and passed that passion along to his two children. Having spent a lifetime fishing, hiking, skiing, and biking all over Montana and beyond, Luke is eager to share his passion for fishing and the outdoors with his clients. After graduating from Colorado College with a BS in Biology, he returned to Montana and pursued a life outdoors that has included fishing and guiding over much of Southwest Montana, working as a wilderness ranger, fighting fires on a hot shot team, and a working wilderness educator. During the winter months in Bozeman, Luke is a professional ski patroller at Bridger Bowl ski area. 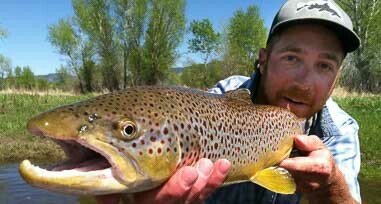 Ben has spent the last decade guiding fly fishing trips on the trout waters of Montana, Colorado, and New Mexico. 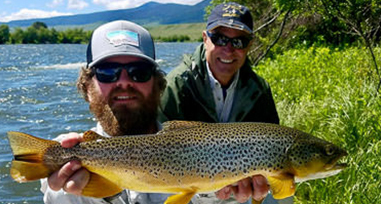 A native of Pennsylvania, Ben was first introduced to Montana fly fishing during a summer job at a guest ranch on Montana's legendary Rock Creek and found his calling. With a degree in Health and Physical Education from Edinboro University, Ben's passion for teaching and fly fishing is evident through his patience and knack for knowing when to throw in some instruction and when to just let his clients fish. Ben's preferred style of fishing is throwing streamers for big trout. When he is not teaching Health Enhancement at Park High in Livingston, MT or coaching track or wrestling, Ben loves getting out in the mountains with his wife and two dogs. Matt's passion for fly fishing and animated sense of humor make a day on the water with him full of big laughs and bigger fish. A native of Massachusetts, Matt grew up fly fishing for smallmouth bass, trout, and Atlantic salmon on New England and Quebec's large rivers. Matt treats each day on the water as an opportunity to teach clients entomology, fish habitat, conservation, and local history. Matt completed his PhD at Penn State University and moved to Montana to pursue his academic career at Montana State University. Now he mostly chases rising trout on Montana's rivers, lakes, and streams. In the off season when he is not fishing, skiing, or tying flies, Matt serves as a Research Fellow at MSU and works as a research scientist for a local research and evaluation firm in Bozeman. Don't let Red Beard's easy going demeanor fool you, his passion for fly fishing and commitment to doing whatever it takes to put fish in the net quickly become apparent after a day on the water with him. Red is a veteran on our local waters and seems to know each rock, bend and drop off on hundreds of miles of water in Southwest Montana. After earning a B.S. in environmental science and winning a National Championship playing soccer for Bethany College, he moved to Montana to pursue his love for hunting and fly fishing. He has been a fixture guiding Montana rivers for over 15 years and also guides big game hunting in the fall. Eric Knoff grew up fishing walleye, pike and bass in Minnesota. 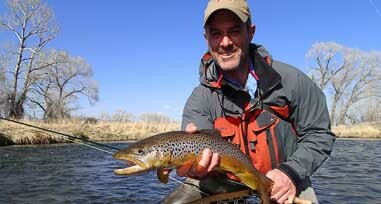 He moved to Bozeman Montana in 1994 and immediately got hooked on fly fishing. In between fishing and climbing trips, Eric attained a bachelors degree in physical geography from Montana State University. After college, Eric continued to follow his passion for climbing and fishing to the mountains and rivers around the world. After eight years of guiding for Exum Mountain guides in the Tetons of Wyoming, Eric has turned his focus to teaching the art fly fishing. Eric is an enthusiastic teacher and will go the extra mile to make sure your fishing technique is ready for an exciting day on the river. 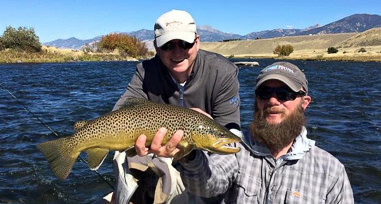 Whether it is casting dry flies on the Gallatin or chasing big trout on the Yellowstone or Madison, Eric is committed to making sure your fishing trip will be fun, safe and memorable. Adam grew up fly fishing the mountain streams of New Hampshire and followed his passion for large trout to Bozeman in the mid 90's. Adam holds a landscape design degree from Montana State University and moonlights as a custom woodworker and cabinet builder during the off season. His hand made walnut landing nets are a true work of art! 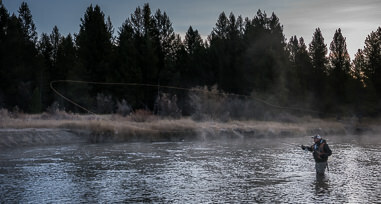 Adam is an avid dry fly and streamer junky and frequently makes the drive to Idaho during the winter months to pursue large steelhead on the fly. He has been guiding on our local rivers, spring creeks and lakes for over ten years and his appreciation for our local waters is quickly noticed when you spend some time in his boat. Adam's vast knowledge of the sport of fly fishing combined with his easy going personality help to make him a popular guide with many of our guests. 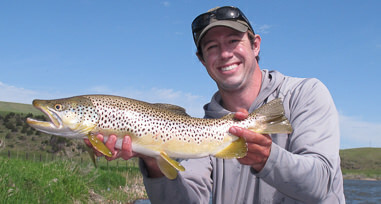 Garrett Blackburn learned to catch trout at a young age on the waters near Saratoga, Wyoming and Arkansas’s White river. 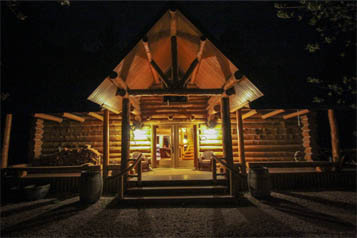 In 2003 he moved to Montana to attend college at the University of Montana and began his guiding career in the Bristol Bay region of Alaska at Bristol Bay Lodge. After graduating, he began guiding year round on the rivers of Southwest Montana in the summers and Chilean Patagonia during the winters. 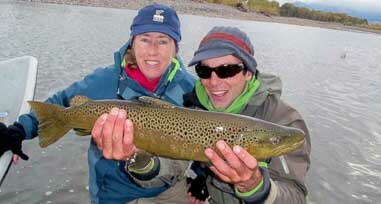 For 7 winters he guided anglers in Chile at Martin Pescador Lodge where he also served as head guide. Today Garrett spends most of his time on the water guiding anglers on the Madison river but loves to explore fisheries all over Montana. Neil has never worked a day in his life. After learning to fly fish at 10 years of age and ski as soon as he could walk, Neil's passion for the two sports have shaped his life. Neil started guiding at the age of 18 and has been guiding fishing trips and working in fly shops ever since. Neil has dedicated his free time to learning the local waters of southwest Montana and is always searching for a bigger fish than the last. He is as fishy as they get while still being incredibly patient, teaching fly fishing skills to all levels of anglers. A graduate of Montana State University with a degree in Geographical Snow Science and an EMT license, Neil spends the winters on the pro patrol staff at Big Sky Resort. There are very few days you will not see Neil on the river or on the slopes. Hence why he has never sat at a desk or, in his opinion, "worked" a day in his life. Matt developed his love of fishing as a youngster growing up in Maine, chasing striped bass on the salt water and native brook trout on local creeks. After earning a degree in architecture in 2010, Matt decided the office life wasn't for him and devoted himself to all things fly fishing. After working on the Kenai river in Alaska, Matt guided for several seasons out of Missoula before making the permanent move to Bozeman. Matt loves dry fly fishing and takes great pleasure in getting his clients on fish by throwing dries to rising trout. In the winter Matt spends his time as a commercial fly tyer, hand tying thousands of flies each season. If you fish with Matt, you'll have the chance to fish Matt's tried and true patterns that he has been developing for years and can't be bought in a shop. Ethan grew up fly fishing the bass ponds and trout streams of southern New England before moving out west shortly after high school. While obtaining a degree in Fish and Wildlife Management, he spent his summers bouncing around the Rocky Mountains chasing trout and eventually guiding in Alaska. Despite the temporary nomadic lifestyle, Bozeman always stayed his home base and now serves as his permanent home to guide from. 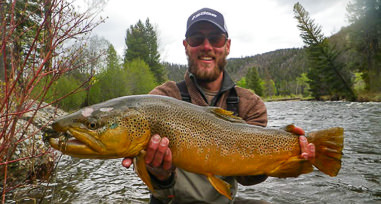 In addition to guiding, Ethan serves several roles at Montana Angler including overseeing the fly shop, scheduling trips, and hosting trips to some of our international destinations. When Ethan is not out guiding or in the office, you will find him exploring new channels of the Madison River or hiking to some unnamed high mountain lake in search of solitude and unpressured trout. Rob's resume tends to evoke envy among even the most seasoned outdoor adventurers. Rob holds a BA in Wilderness Leadership and over the years has worked as a trekking guide in Switzerland, white water raft guide in Colorado, Utah and Alaska, and a heli-ski guide in California, Chile, Alaska and Kashmir. In addition to Rob's many other talents he is also an exceptional fly fishing guide and these days splits his time between Montana summers guiding anglers and Alaska winters guiding heli-ski clients. Rob brings a great blend of passion and patience to the river each and every day. Carter was born and raised in Baltimore, MD and left the metropolis behind soon after to pursue big trout on the rivers of Colorado. 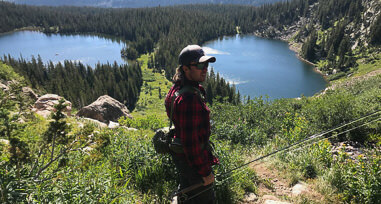 After earning degrees in Economics and History from the University of Denver, Carter's passion for fly fishing led him north to the trout waters of Montana. An ideal day of fishing for Carter involves seeking out the least pressured water and sacrificing high catch rates in exchange for netting a couple monsters. Carter stays busy with big game hunting in the fall and working on the slopes of Bridger Bowl ski area in the winter. Jeff was given his first fly rod at the age of twelve and never looked back. He has been perfecting his Montana fly-fishing knowledge for over 20 years on local rivers, streams and lakes. He is also an award winning science teacher at Belgrade Middle School. He holds a B.S. in Business Management from Central Connecticut State University as well as a B.S. in Elementary Ed. and a M.S. degree in Science Education from Montana State University. When not guiding or teaching, Jeff enjoys spending time outdoors with his three kids. Though Bozeman is a long way from Tim's native New Jersey, he feels right at home with a rod in hand on the local waters of southwest Montana. After growing up chasing striped bass and fishing the Great Lakes' tributaries, Tim broke in to the guiding profession on the waters in and around Colorado's Rocky Mountain National Park. 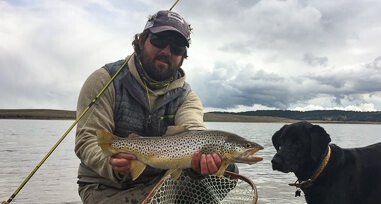 Several seasons and many trout later, Tim made the move to Bozeman to take his guiding and recreational fishing to the next level. Tim's enthusiasm for teaching newcomers the sport is infectious and his breadth of knowledge has something to offer to novice and experienced anglers alike. When Tim is not on the water or defending his Jersey accent, you will find him chasing elk with his bow or waterfowl with his dog. Tom's passion for fly fishing is palpable and any day spent on the water with Tom is sure to be a memorable one. A native of New Hampshire, Tom earned a degree in Economics from UNH before making the move out west. As with many of our guides, Tom realized his desire to share his passion for fly fishing with others was not achievable from behind a desk, so he dedicated himself to a career in guiding. 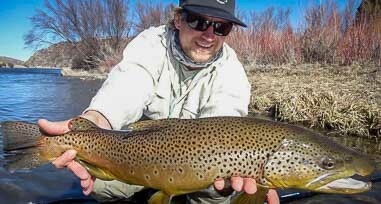 Tom spends a lot of time fishing the Gallatin, and loves throwing dry flies on the seemingly infinite small streams in the area. When not skiing, Tom spends the winter laying down fresh corduroy on local cross country ski trails. 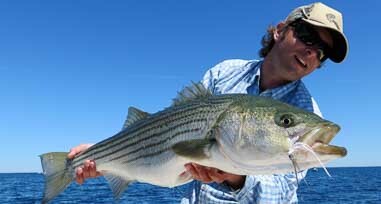 John developed his fishing skills early on the inshore waterways of Massachusetts, hunting the striped bass and blues of Cape Cod and the North Shore. After graduating from the University of Vermont with with a B.S. in food science, he relocated to Bozeman and has been chasing trout ever since. John is an avid fly tier, spending many hours during the winter months at a vice spinning feathers. He has also spent several seasons as a ski patroller and is a certified EMT. Dario's gregarious personality, well rounded fly fishing background and commitment to teaching produce a winning combination enjoyed by many of our guests. If you are lucky enough to spend the day with Dario the chances are good you will enjoy a regular supply of both of laughs and fish. With years of experience under his belt on our local fisheries he has a knack for being at the right place at the right time and his clients always seem to have a bent rod. Dario grew up in the sagebrush flats of Northern Nevada where he spent his youth exploring the remote and wild Great Basin hunting chuckar and mule deer. His love of the outdoors quickly expanded to fly fishing which help prompt the relocation to Bozeman which has just a few more fisheries than the Nevada desert. Dario's off season adventures regularly carry him to the tarpon flats of Florida, the hidden peaks of Peru and the hidden canyons of Southern Utah. Chris Connor makes his home in the heart of the Madison Valley with his wife and children. He is a Madison river fly fishing specialist and you will be hard pressed to find another guide that is as patient, courteous and hard working as Chris. 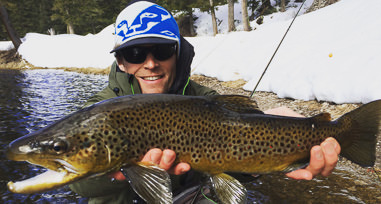 Although he enjoys throwing hoppers as much as anyone, his real passion is dragging massive bunny fur streamers through the productive riffles of the Madison to hook up on the monster cannibalistic brown trout that live there. Chris is also an accomplished horseman and outdoorsman and spends his fall in the mountains guiding elk hunting trips in the Madison Range. We guarantee you will be impressed with both his extensive river knowledge and easy going nature. With over 20 years of guiding experience he has the confidence to catch trout in every condition. Chris is quite simply a great guy to share a boat with for the day. Ryan grew up in Tennessee where he first started fly fishing for trout, bass, bream and crappie. After studying business at Freed-Hardeman University he moved to Nashville where he spent a decade working in IT. He moved to Montana in 2012 and now spends his summers chasing trout. Ryan’s specialty is walk wade trips where he enjoys showing newcomers how to catch fish. In the off season he operates WillowTail Farm, an outfitting service in TN for duck hunting. In the spring months he guides bass, crappie, and bream fishing trips back in his home waters near KY lake. Kevin Guettler, a fourth generation Montanan, is defined by pure and infectious enthusiasm for fly fishing and all things outdoors. His legendary enthusiasm for local waters (and everything else in life) will go a long way towards creating a memorable Montana experience. When forced indoors, Kevin is fortunate to be able to work for the Bozeman School District teaching eighth grade students Math and P.E. Kevin earned a B.A. in Sociology and a Masters in Math Education from the University of California Santa Barbara. Outfitter and owner Brian McGeehan grew up fishing the limestone streams of Pennsylvania as a youth. 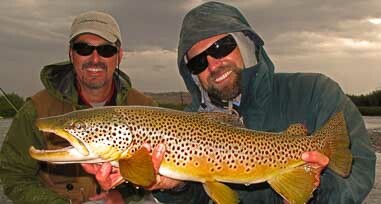 His passion for fly fishing brought him to the West where he started his guiding career in the mid 90's in Colorado. 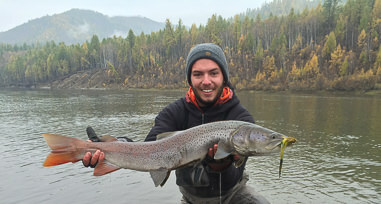 In addition to guiding he spent years teaching middle and high school science before leaving teaching to devote his full attention to Montana Angler. As an educator he started a successful youth fly fishing club as well as a rigorous science fair program where he still volunteers to mentor students. 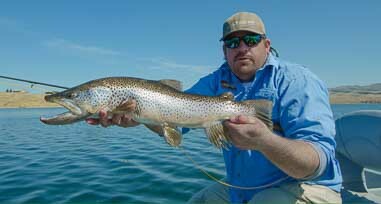 Brian is regularly featured by Trout TV, Ask About Fly Fishing radio show, Outdoor Life and several online publications. He leads annual hosted trips to Argentina, Chile and the Bahamas in the off season. He and his wife Ann (also our business manager) are parents to four energetic children. He holds a B.S. in geosciences from Penn State, a M.S. in civil engineering from U.C. Berkeley and a M.S. in science education from Duquesne University. Michael honed is fly fishing skills while working as a packer in Montana's Bob Marshal Wilderness along the South Fork of the Flathead River. 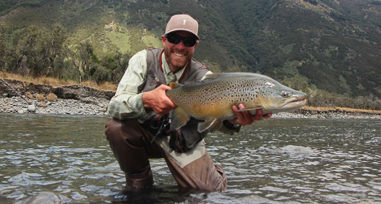 Micheal's well rounded guiding background is a result of his time throwing dry flies on one of the world's premier native cutthroat trout fisheries, sight fishing the gin clear water of New Zealand, and years of bird and big game hunting when not guiding fly fishing trips. Eventually settling down in Bozeman, Mike works hard each and every day to get his clients on great fish, enjoy some laughs on the river, and produce memorable days on the water.